Would you like to be a trustee of our charity? every parent and teacher knows this, at some level: the challenge is to make education fit for these creative learners. At Sightlines we know this and our vision is for all children to get the chance to be just that – children, who are eager and willing learners and explorers. We want to give them the best start possible – not crush them in to a system that only has one size for all: in the phrase of the advocacy organisation to which we belong: children are more than a score. We are an independent national organisation promoting an educational approach in primary and early childhood education which works to our children's creative and inquisitive dispositions. We are seeking new Trustees of our charitable body, to help us: we are seeking three individuals to join, in being part of this. We particularly welcome application from individuals from outside of education – yes, with the same shared passion of course, but perhaps with complementary expertise. Areas of expertise which we think would be beneficial include Communication; Social Networking; Change Movement work; Advocacy; Business/Cultural Networks; Community Action – these are ideas though, not an exclusive list. We are committed to a new additional direction in our work – the informing and motivating of our nation's parents, grandparents, and all wellwishers of children's lives. Our children – your children – could right now be offered educational experiences and schools which they want to eagerly rush to first thing in the morning. The climate of education needs to change, for the sakes of all of us: educators and parents need to work together to do this. The one can't do it without the other. We at Sightlines can demonstrate how education can be, but this needs championing broadly. (We have discovered that, as a group, politicians cannot lead a change of direction – they are preoccupied by fears about their own jobs, toeing the line, short-term actions, and 'economic returns.' They need the reassurance of a groundswell for change.) Could you be part of this new vision? Please pass on to any friends/colleagues you also think may be interested. ​For educators and parents, fresh and seasoned: here is news of a very informative seminar for all who are minded to protect and develop a broad experience of education. It comes at a time when (again) the current UK government is proposing new assessment regimes for young children in its continuing march down the narrow avenues of instruction. "2017 is the 50th year since the publication of 'Children and their Primary Schools', better known as The Plowden Report. Plowden has been a consistent reference point since that time and has come to stand for child-centred, socially conscious primary education. It prompted an international interest and educators from across the world visited English primary schools – notably in the West Riding of Yorkshire, Oxfordshire, Hertfordshire and Leicestershire. Our conference invites teachers and others concerned with primary education to recall Plowden and ask what we have learned since and what we have forgotten." The event is free, funded by University of Cambridge & History of Education Society. 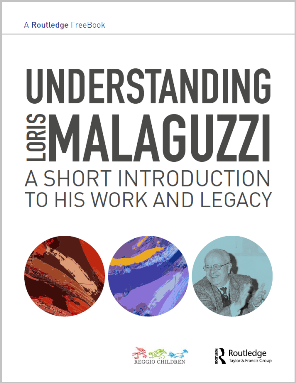 ​In preparing for our 11 November conference 'All our Futures' in London, and we're reminded that the Freebook version of the new edit of Loris Malaguzzi's writing remains available from Routledge. Click on the image or go here to get it. Conference participants will also get a discount on Routledge books - for the day only -.from the Contesting Childhood series. We will not stock all of the series, but if you're coming to the conference and would like a specific title, we can make sure it's there for you. Of course we will also have Sightlines Initiative and Reggio Children publications.